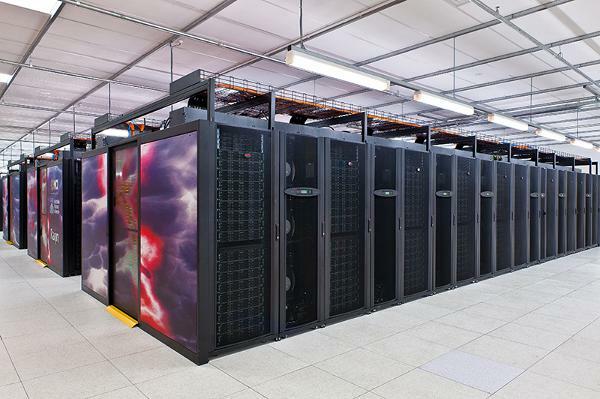 Raijin, Australia's most powerful supercomputer at the Australian National University. The 1.2 petaflop Fujitsu PRIMERGY cluster at the ANU’s National Computational Infrastructure (NCI) performance computing centre has been in production since mid-June after several months of performance testing. The NCI is funded through a $50 million co-investment from the ANU, Bureau of Meteorology, CSIRO, Geoscience Australia, and other research-intensive universities supported by the Australian Research Council. The centre was opened by Kim Carr, Minister for Innovation, Industry, Science and Research. He was joined by ANU vice-chancellor Professor Ian Young; Bureau of Meteorology CEO Dr Rob Vertessy; director of the ARC Centre of Excellence for Climate System Science, Professor Andy Pitman, and CEO of Geoscience Australia, Dr Chris Pigram. Around 30 per cent of the processing power of this machine – named Raijin after the Japanese god of thunder, lightning and storms – is being used for calculations in the area of Earth system science. “When the Bureau of Meteorology ramps up to full steam, the use in this area will go to around 50 per cent, which is what it was always intended to do,” Professor Lindsay Botten, director of the NCU told, CIO Australia on Wednesday morning. All but 50 cores of the 57,472 Intel Xeon Sandy Bridge 2.6GHz processor cores are currently in use, he said. The supercomputer also features 160TB of main memory and 10PB of disk storage. Professor Botten said NCI has seen impacts on “science outputs” with this machine that weren’t possible previously. He said that one user who works in fuel engineering at the University of New South Wales used 32,000 cores to model the next-generation of biodiesel fuels; while creating astrophysical simulations and ocean models can also use between 4000 and 6000 cores. The machine is also enabling the Bureau of Meteorology to make better predictions about currently occurring extreme weather events occurring in the space of minutes, weather patterns “five to 10 days out”, as well as predict climate change patterns over decades and even centuries. Governments, of course, are particularly interested in longer-term weather predictions because they will influence climate change policies, said Professor Botten.